This is a guest post from Ben Lyon, co-founder and VP of business development of Kopo-Kopo, a Nairobi-based software company enabling enterprises to accept mobile payments. A scan of tech investor blogs reveals two conflicting sentiments: 1) when the bubble bursts, the industry will come to a grinding halt, and 2) valuations are skyrocketing because of what Mark Suster calls FOMO (fear of missing out). They also reveal that an abundance of capital is chasing a scarcity of good ideas, which may be one reason why companies like Color, The Melt, and The Naturally Curly Network have collectively raised over $50M. But that’s in the US. Africa is the opposite story: there’s an abundance of good ideas chasing a scarcity of capital. Not only are there ample investment opportunities in Africa, but many of the tech companies behind them are capital efficient, have realistic valuations, and have first-mover advantage. With three fiber cables, anetwork of tech labs, a vicious price war between mobile operators, and the arrival of affordable smart phones, tech companies in East Africa in particular are positioned to capitalize on an exploding market. Even though LinkedIn, Groupon, and a looming host of other companies (Facebook, Twitter, Zynga, etc) are IPOing in the US, the IPO vs. M&A ratio is still 10:1. In East Africa, that ratio is even higher on the side of M&A (only 55 companies are listed on the Nairobi Stock Exchange). That said, tech companies in East Africa are being made to be sold. When multi-national companies decide to enter the East African market, as MasterCard and Visa are planning to do in Q3 2011, their first step will likely be via strategic acquisition. For example, Visa recently acquired Fundamo, a mobile money platform provider, for $110M. Visa’s move, not only validated the mobile money industry in Africa, but signaled that Visa considers the Sub-Saharan African market critical to its success. 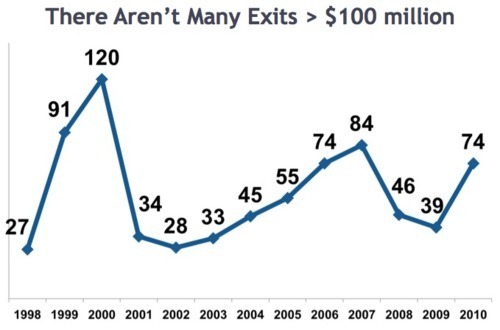 As Fred Wilson, Mark Suster, and Seth Levine – all prominent VCs – have all been writing about, a $100M+ exit is nothing to laugh at. Conclusion: Africa is rising. The continent’s 1B+ people are largely young, urban, tech savvy, and brand / status conscious. Pockets of the continent – Accra, Cairo, Lagos, Nairobi, etc. – are globally-connected. They read Mashable and New York Times. They demand accountability and transparency. And they are the future. As the perception-reality gap continues to close, investors would be wise to start exploring the market now, because, before we know it, everyone will be investing in Africa. Josh Weinstein is a policy and economics dilettante and would-be travel writer. He hopes you enjoy reading his blog.